Check Out Our Top 10 Chipping Nets Reviewed. Check Out Our Top 10 Golf Hitting Nets Here. As anyone who’s ever played it knows, golf isn’t an easy game. Improvement takes a whole lot of commitment, but unfortunately it isn’t always easy to find the time needed to get yourself to the next level. That’s where golf nets come in. Rather than having to head down to your local club and have a hit, a golf net allows you to get in the practice you need from the comfort of your own home. Where you used to need two hours to get in a hitting session, with a golf net, all you need is 15 minutes. Practice is key to improvement in anything that you do. As legendary golfer Gary Player once said, ‘the more I practice, the luckier I get’. Whether or not it was actually him who coined this phrase is sometimes debated, but regardless, the point remains – practice has a tangible influence on performance. Going even further down this route, journalist, author and public speaker Malcolm Gladwell came up with ‘the 10,000 hour rule’, which purported that 10,000 hours of practice in any field is required to reach the level of a professional – regardless of talent. Presumably, none of you are going to go ahead and commit to golf to that level, but the rule is yet another reference to the impact of practice. Put simply, golf nets allow you to practice more. They give you the opportunity to take a 15 or 20 minute window of spare time, and turn it into a useful hitting session. 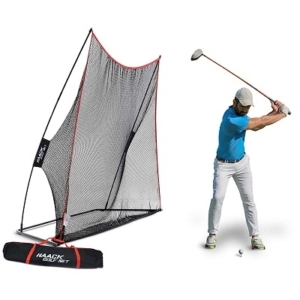 According to Golf Digest, a golf net is one of the top ways to invest in your game, and when you consider the amount of extra time you can spend on your game if you buy one, it’s easy to see why. I used to suffer from a lack of time to practice myself. It certainly wasn’t an issue of motivation – I love the game and always want to improve, but I simply didn’t have the time nor the energy after a day of work to pack my golf clubs into the car and drive down to my local course. But everything changed when I bought a net – now, all I need to do is dedicate 20 minutes a day to hitting balls outside my house, and my game has seen a huge difference. What kind of net will bring down my handicap? Golf nets come in many different shapes and sizes, and it’s important to know which type is suitable for you. Fairly simply, they can be separated into chipping nets and hitting nets, with the former obviously coming in a fair bit smaller – and typically a little cheaper. Chipping nets, as the name suggests, are typically used to practice your short game. They are smaller and consequently usually a little easier on the wallet, so if you don’t have a lot of space, have a small budget, or both, they could be the answer for you. Of course, these limit amount you can practice. You won’t be able to pull out your driver – or even a short iron – and have a hit on these, meaning many of the problems you faced prior to purchasing the net may continue to exist. Having said that, there is a tendency for amateurs to focus disproportionately on their long game, strange considering, according to pro Jim Vogt, 65% of your shots come from within 100 yards – so perhaps there is something to be said for buying a net which will force you to focus on your touch. And what’s more, they’ll allow you to implement tips like these ones. Even if you can’t see the end result of your shot, you can practice the technique which will allow you to better execute. These nets let you practice whatever you need. Want to thwack your driver a couple of hundred times? No problems. Been hitting your short irons skinny? Start hitting them right with a few hours of hitting into one of these nets. And of course, the major advantage these bigger nets have over chipping nets is that you can still practice your short game. The main drawback is that you’ll need a bit of space. 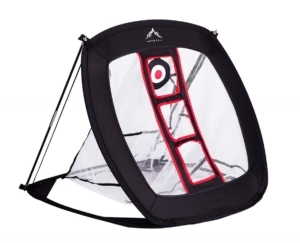 You can buy nets that can be set up either inside or outside, but of course you’ll either need a big, empty room, or enough space to swing a club and give it a few metres of travel before it thumps into the net. How can Golf Nets improve my game if I can’t see the ball flight? This is a common problem many people have with nets, and of course there is an element of validity to it. There’s nothing quite like being able to watch your shot in its entirety, to better know how much draw or fade you’re putting on the ball, how softly it’s landing and so on. But the benefits of the extra practice they’ll allow you to undertake make them well and truly worth it. Check out this video by Mark Crossfield, a successful PGA Tour Pro and coach. Crossfield succinctly covers the positive impact on your game which repeatedly hitting balls – even if you can’t see where they ultimately end up – will have. There are plenty of ways to improve your golf, but one common theme throughout many of them is repetition. Whether you’re working on keeping your head still, your right elbow closer to your body, or whatever it may be, you’re going to need to practice it over and over and over to be able to consistently implement it on the course. That’s why golf nets are so useful. Instead of having to head down to your local club to have a hit – something which most people realistically only have the time and inclination to do once or twice a week – you can just wander over to your golf net and start hitting. There are various kinds of nets you can buy, and which one you choose is contingent on things like the amount of space you have and the budget you’re operating on. The needs for each individual will be different, so don’t feel obliged to buy a certain product. Instead, figure out your needs, what’s going to help you, and buy the net that suits you. I did, and it had a huge impact. Why not try one out? ​Check Out Our Top 10 Chipping Nets Reviewed.